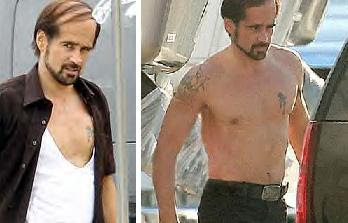 Colin Farrell was snapped on the set of his upcoming movie, Horrible Bosses. Check out his comb over wig, LOL! The film's all-star cast includes: Jennifer Aniston, Jamie Foxx, Kevin Spacey, Jason Bateman, Lindsay Sloane and Donald Sutherland. Horrible Bosses is about three friends who conspire to murder their awful bosses when they realize they are standing in the way of their happiness.